I’m reminded of a story. In 1984 Wethersfield Connecticut was celebrating their 350th anniversary. At the time I was the Director of the town’s Youth Service Bureau (YSB). To honor the event I had the “brilliant idea” of having students, who had been in ROPE®, break the world’s circle sit record. Notice I didn’t say, “try to break the world’s circle sit record.” The formulation of brilliant ideas rarely considers that they may not work or the energy, resources and effort necessary to “try them,” let alone have them succeed. Brilliant ideas are usually BIG! I looked up the world’s circle sit record and found that a Japanese car company had 6000 people do one for a commercial. Ok, so we won’t have the world’s record, we’d have the Connecticut record. There was no circle sit on record in Connecticut. Perfect! I conceived the plan on how to achieve this and got agreements from everyone at the school, no minor achievement given the amount of practice time required during the school day. I even recruiting the town’s engineering department to calculate how big the circle would be for over 500 people that we expected to engage in the experience. The YSB staff and I went to all the classes in the middle school and began the preparation and practice in small groups, explaining the plan and what we hoped to accomplish together. It was incredibly hard work and took an enormous amount of time. It occurred to me then, as it has occurred to me many times since that it’s not that hard to come up with seemingly brilliant ideas, even some that are worth doing and are really brilliant. It is always much more work than you could imagine. Imagining the idea was the easy part. 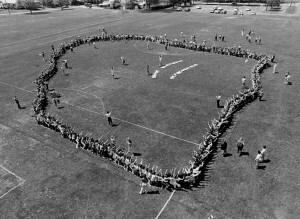 The Connecticut Circle Sit Record Attempt, as it was headlined in the news became an enormous spectacle with all of the Board of Education, City Council, mayor, dignitaries, hundreds of parents and citizens there to watch. The fire department set up their aerial truck with the Hartford Courant photographer high atop it to take pictures. The local TV stations were there as well. So there I was in the center of the circle with the principal of the middle school and 500+ middle school students, teachers and parents filing out of all the doors of the school. It was a terrifying sight. I knew this was a one shot attempt. If the students did not sit together in unison there would have been hundreds of adolescents piled on each other with little hope of reorganizing them. Ken Edwards, the principal, is standing next to me. We both have our jaws open in abject horror, staring at the mass of laughing exuberant adolescents coming towards us. He turns to me. I can hear his voice now as if it was yesterday, says: “Blumenkrantz! What did you get me into? If this thing fails its all your fault! If it succeed I’m taking all the credit.” Of course he was joking, I think. The point is you never know the extent of energy and time needed or the scope of a “brilliant idea” in action until you begin the task of making it happen. What you need to know going in is that it’s always a team effort, requiring enormous work, collaboration, patience and a sense of humor. The photo above shows the results. It was taken from the Wethersfield Volunteer Fire Department’s aerial truck and appeared on the front page of the Hartford Courant. The white lettering under the person with their hands up says “Happy Birthday Wethersfield”. I’m the guy over the “H” still hearing the echoes of the roar of the students, hands in the air yelling, “Happy Birthday Wethersfield.” And, yes, they all stood up together. Click here to learn more about how to “Change the Story – Transform the Future. Please enter your name and email address to receive notices of blog posts, events, and other news related to community rites of passage from the Center for Youth & Community, Inc. The Rite of Passage Experience© and ROPE® are copyrighted (1981, 1988, 1998) and federally registered trademarks of David Blumenkrantz licensed to the Center for Youth & Community, Inc.